Old Forester has about as much tradition as you can get in a Bourbon. It is a single brand of Bourbon that has been continuously available for 145 years — most of that time from the same family of craftsmen at the same distillery. Interestingly, it was the first Bourbon to be available exclusively in sealed glass bottles. There was a lot of nefarious re-bottling and dilution going on and this was a way to ensure quality and integrity. Today it is owned by Brown-Forman, available in eight different varieties and is a sister Bourbon to Woodford Reserve. 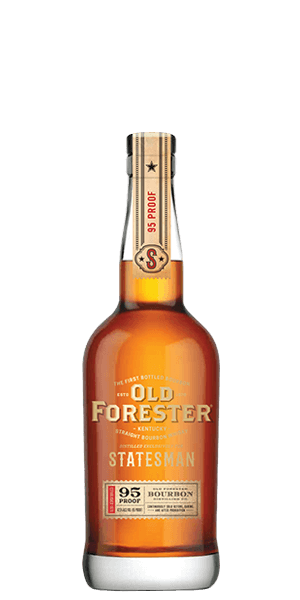 Old Forester Statesman came out recently in August, 2017. They created this release to coincide with the release of a new film — “Kingsman 2: The Golden Circle” which premiered in September. The master distillers at Old Forester had a bit of fun in the process, deciding to go for the bold. So they selected casks from the warmest parts of the warehouses. Some of the casks had even been exposed to sunlight. The result is an intense, spicier Bourbon that turns up the heat. And it works — American Whiskey Masters has already given this limited edition their highest honor. What does Old Forester Statesman taste like? The Flavor Spiral™ shows the most common flavors that you'll taste in Old Forester Statesman and gives you a chance to have a taste of it before actually tasting it. Clove, chocolate, coconut, and vanilla. Leather, brown butter, cinnamon, and grapefruit. Long with baking spice, eucalyptus, and candied orange. Carmel and vanilla are the name of the game. This is such a smooth drink without being overly sweet, definitely has become a staple of my home bar. I purchased my bottle for $50 which made it an absolute steal. Smooth with a slight burn at the end not to strong but just right. Great bourbon. Similar to Blanton's. I like it a little better than 1920 which everyone else seems to love the most in the OF line right now. Hated it. Just tasted hot and not in a good way. Pleasantly spicy up front and the finish stays with you. I’m still learning the nuances of taste differences but I do get a bit of a buttery flavor. Would love to find that candied orange finish that is described. I would buy this again. Very nice! Better then I thought it would be! Great flavor, deep and lingering. A nice flavored lingering drink. Definitely strong. Very good, lots of spice and the old forestor famous Pepper.